Some tree dwelling birds build nests in the branches of trees and shrubs, while others nest in the cavities of trees. Two kinds of cavity nesting birds will nest in your yard, primary and secondary. Primary cavity nesting birds build their houses by pecking and removing wood from a tree limb. Most primary cavity nesters are woodpeckers, who have the ability to excavate their own holes. Secondary cavity nesters generally use old holes of a primary cavity nesters like a previously excavated woodpecker hole. They also will nest in natural cavities that are often created when limbs break off trees. Bluebirds and chickadees are examples of secondary cavity nesting birds. Some cavity nesting birds can be enticed to nest in man made nest boxes. Using nest boxes not only will help our native birds but it is rewarding for us as well. 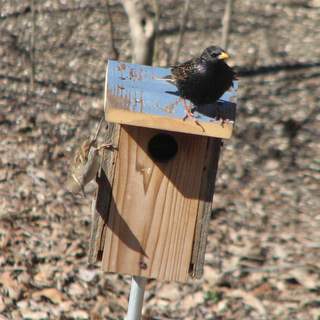 Beware that often nest boxes are usurped from native birds by either of two invasive birds: the house sparrow and the European starling. Erecting nest boxes (birdhouses) is one way to attract some cavity nesting birds. The design of the nest box are important if you are to be successful attracting native birds. Each cavity nesting species of bird requires a specific box size, hole size, and mounting height. The method used to mount them is as important as the design. They must be mounted to prevent predators from accessing the box. Using nest box traps are important for controlling invasive species that will prevent native birds from nesting. Both the European Starling and the House Sparrow prevent our native birds from nesting. Learn about these nest box topics. You will want to attract cavity nesting birds like woodpeckers by feeding them suet, especially in the winter time. Suet supplies the birds with a high energy food because it is mostly made from animal fat. The homemade suet I use is made from animal fat, peanut butter, oatmeal, corn meal, and wheat flour. It is the preferred food of all woodpecker species. By attracting the birds to your yard with the homemade suet, you will more than likely get them to notice any nest boxes you have erected. My Homemade Suet Recipe is easy to make and will definitely bring in the birds. Besides cavity nesting birds expect to see brown creepers and yellow-rumped warblers. Native trees that are preferred by cavity nesters tend to have soft wood that is easily excavated. Cavity nesters don't just need the trees for nesting, but also for foraging for food for their hatchlings. Alien tree species do not support insects which the birds need to raise healthy young. Native tree species support hundreds of insect species that feed our native birds. Favorite native trees for cavity nesters include Eastern Cottonwood - Common Hackberry - Silver Maple, Box Elder - Peach-leaved Willow. 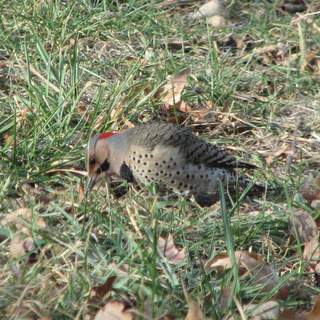 Having dead trees or dead tree limbs in your landscape is also important, especially for woodpeckers. Woodpeckers prefer making their home in the limbs of dead trees as well as foraging for insects that eat the dead wood. If a dead tree isn't a threat to your property or neighbor's property, consider leaving it for woodpeckers and other wildlife. Primary cavity nesting birds make their own homes by excavating holes in trees. They generally will not adopt nest boxes for nesting. For a better chance to get them to nest in nest boxes, fill the box with wood chips. The woodpeckers will clear out the chips as they would excavate a hole. A better way to attract them is to leave dead trees in your landscape. Dead limbs in live trees will be used by them as well. There are many secondary cavity nesting birds found in Kansas. Many of these will adapt to nest boxes, if properly constructed and placed. Both of these species compete with our native cavity nesting birds. Do not allow either to nest. If they attempt to nest in a nest box, they can be trapped using a Nest Box Trap. The European starling and house sparrow are aggressive introduced species that compete with native cavity nesting birds. They will harass and even attack and kill native cavity nesters, in an effort to nest. Both the starling and the house sparrow start adopting nesting sites well before our native birds start searching out nesting locations. Their populations are so large that our native cavity nesters don't have much of a chance to compete with them. European Starlings can be prevented from using nest boxes (bird houses) meant for bluebirds by the 1 1/2" entrance hole. For larger sized holes, using a nest box trap is the only solution. Learn more about European Starling Control. House Sparrows cannot be prevented from using nest boxes (bird houses) meant for bluebirds as they can enter a 1 1/2" hole. Using a nest box trap can be used to prevent them from nesting. Learn more about House Sparrow Control. Only nesboxes made for House Wrens and Chickadees can be made to prevent House Sparrows from entering. These species can enter a 1 1/8" hole. One productive method for controlling both of these species is to use a Nest Box Trap.